At any point in time, there are millions of neurons at work, firing off signals through your brain and your various systems (memory, visual, motor, etc. ), assisting (and controlling) how you walk, talk, act, eat, wake up, sleep, read and much, much more! The brain does so much for us, yet “most of us have no idea how our brain works.” Even the field of science doesn’t completely understand it. “In truth, if we ever fully understood how the human brain knew how to pick up a glass of water, it would represent a major achievement” (page 4). 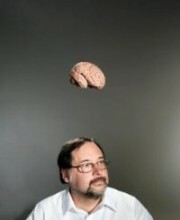 In Brain Rules, molecular biologist John Medina shares twelve Brain Rules – “what scientists know for sure about how our brains work” – and provides insight into how we can use these rules to better our lives both personally, and professionally. And in our current attention-based economy, one specific area of interest is how our brains decide what we pay attention to, which directly impacts what we remember and how we learn. “Does it matter to learning if we pay attention? The short answer is: You bet it does… The more attention the brain pays to a given stimulus, the more elaborately the information will be encoded – and retained” (page 74). "The brain doesn’t pay attention to boring things, and I am as sick of boring presentations as you are." Just think, as you’re reading this right now – yes, this word right here and here – your brain is not only at work actively translating this combination of symbols (letters, words, sentences, periods, etc.) into something you can understand, but it’s also determining what, and how, you actually remember as you go along. And it’s doing all of this at an alarming rate as it also actively engages other parts of your brain such as memory, to help decide what you’ll (hopefully) remember. But what actually grabs our attention in the first place? What makes us pay attention, and keep paying attention, to something? Well, for starters, we don’t pay attention to boring things. "You’ve got seconds to grab someone’s attention and only 10 minutes to keep it. At 9 minutes and 59 seconds, something must be done to regain attention and restart the clock – something emotional and relevant." Through his own questioning and different peer-reviewed studies, John discovered that students and audiences start to lose interest 10 minutes (or 20%) into a presentation. He also found that our attention ability is centered on four key behavioral characteristics: emotions, meaning, multitasking, and timing. Simply put: we remember emotionally stimulating events, enhance our memory by creating associations between concepts, cannot multitask when it comes to paying attention and need a break to help digest information. Putting his findings together, John created The 10 Minute Rule. It’s a method he’s practiced in the classroom by dividing his lectures into discrete 10 minute segments. It’s also a method for which he was named the Hoechst Marion Roussel Teacher of the Year. “Starting with general concepts naturally leads to explaining information in a hierarchical fashion. You have to do the general idea first. And then you will see that 40 percent improvement in understanding” (page 90). Spend the next 9 minutes providing the detailed description of the single core concept, taking time out to explain the relationship between the details and the core concept. “The trick was to ensure that each detail could be easily traced back to the general concept with minimal intellectual effort. I regularly took time out from content to explain the relationship between the detail and the core concept in clear and explicit terms” (page 89). Remember that you only have 10 minutes to keep someone’s attention, so you need to present something compelling to keep the attention at the 9 minute and 59 second mark if you plan on presenting for more than 10 minutes. Trigger an emotion (fear, laughter, happiness, etc.). Make it relevant to the provided content. Place it between your modules, where you look forward and introduce the new content. “Do we know something so potentially compelling? We sure do. The ECS – emotionally competent stimuli. So, every 10 minutes in my lecture, I decided to give my audiences a break from the firehose of information and send them a relevant ECS, which I now call ‘hooks’” (page 89). "Simply put, multisensory presentations are the way to go." To truly captivate your audience though, move beyond just text and oral presentations. Stimulate more of the senses and integrate the power of sight, sound, touch, taste and smell. Why? Because our “sensory processes are wired to work together” and triggering multiple senses affects our ability to pay attention and learn. “Extra information given at the moment of learning makes learning better” (page 209). So how can you integrate the senses in your presentations, lessons or even brain storming sessions? Bring in physical objects related to your topic of discussion that your audience can not only see, but also touch and feel (leading design company IDEO regularly brings in a box of objects to help stimulate their brain storming sessions). Play an emotionally stimulating video to grab your audience’s attention. Combine the power of smell and music as you hook your audience as you share your anecdote. The possibilities here are truly endless, as it’s up to you and your imagination on what you come up with. “Emitting the scent of chocolate from a vending machine, [the company] found, drove chocolate sales up 60 percent” (page 216). From rewiring itself as we learn new things (Brain Rule #3: Every Brain is Wired Differently), to being fully active while we sleep (Brain Rule #7: Sleep Well, Think Well), the power of our brains is truly remarkable. And although we may never completely understand how it works, it’s books like Brain Rules that not only keep us “in the loop”, but also give us a better appreciation for the power we truly have, and how we can use it. “You can get a headache just thinking about the fact that deep inside your brain, at this very moment, bits of neurons are moving around like reptiles, slithering to new spots, getting fat at one end or creating split ends” (page 57).